A compelling novel about four young women in wartime London, from the best-selling author of London Belles and My Sweet Valentine. In Article Row, in London’s Holborn – four young women, Tilly, Sally, Dulcie and Agnes – have already been witnesses to the heartache and pain that Hitler’s bombs have inflicted on ordinary Londoners.Tilly is desperate to wed her beau, Drew. Terrified that something will happen to prevent them from being together, her fears seem to be coming true when he is called back home to America.For her mother, Olive, this only adds to her worries for Tilly. 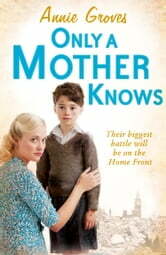 But she has her own hands full when her friend and neighbour, Sergeant Dawson, gets some terrible news. When Olive lends a hand, she finds herself at the sharp end of some unwelcome gossip.For Dulcie, the war has brought an old flame, David, back into her life. But his terrible injuries have changed his life forever. Can something more develop out of their friendship? And for Agnes, she is about to find out something that will change her life, too.In this seemingly endless war, the girls will learn about love, loss and heartache. But they, like thousands of other Londoners, are determined to win the battle on the home front – no matter what it takes.